The Market, this time of year, can almost function as a one-stop shop. 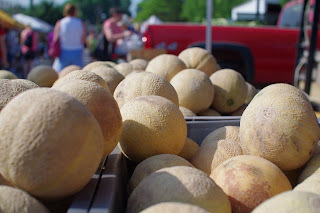 Urbana's Market at the Square is also a big supporter of other markets - the more local foods and goods available in the community, the better. Our Market isn't alone out there. 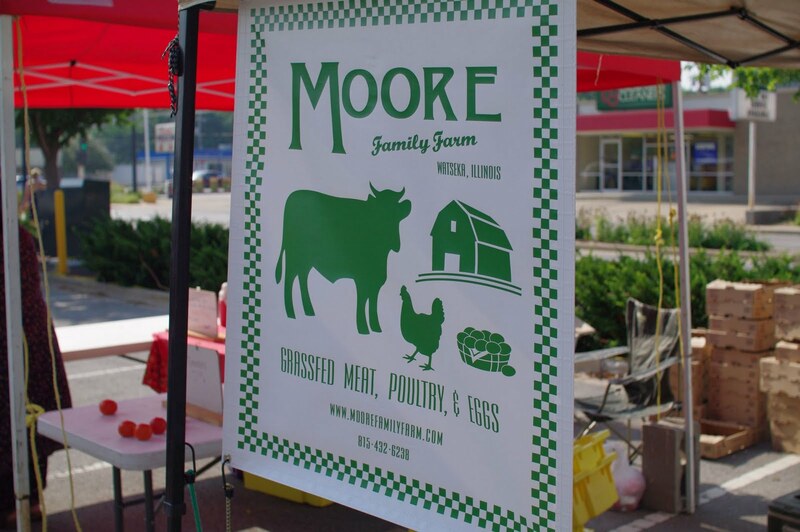 Tuesdays, Market vendor Prairie Fruits Farm opens its farm just north of town to the public, offering not just their cheeses and gelato, but also produce from Blue Moon Farm and breads from Pekara Bakery & Bistro. Visitors can also hang with the goats and check out the farm. 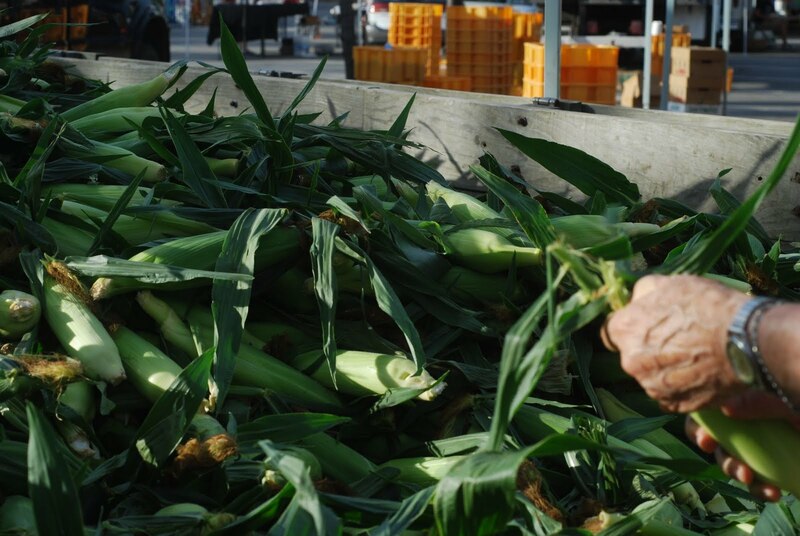 This on-farm market runs from 3-7 each Tuesday. More information can be found at their website. Also on Tuesdays, the Champaign-Urbana Public Health District offers up a small farmers market at their facility on Kenyon Road in Champaign. For more information, call 217-352-7961. Wednesdays, Market vendor Kleiss Produce sets up their market, with others, in the Country Fair Shopping Center on Mattis in Champaign. Click here for more information. They're there from 7 AM - 1 PM. 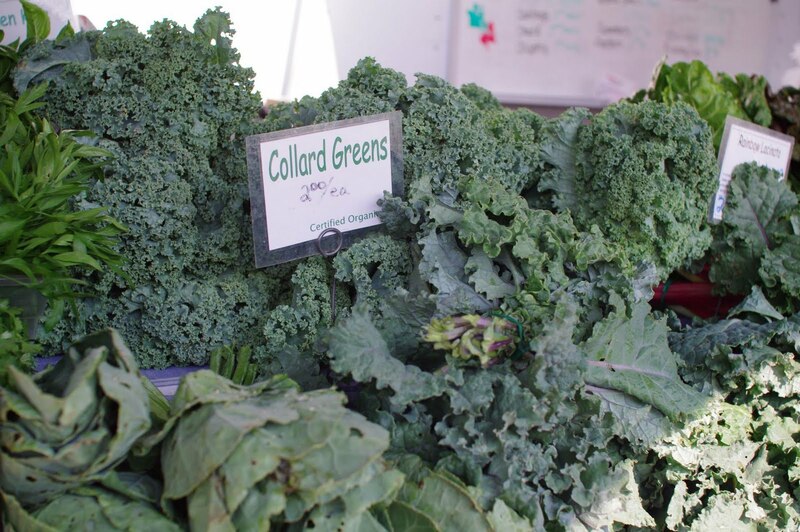 Thursdays, the University of Illinois' Sustainable Student Farm sells its farm-grown produce at their stand on the Quad, just south of the Union, starting at 11 AM and running until 5 PM or sellout. 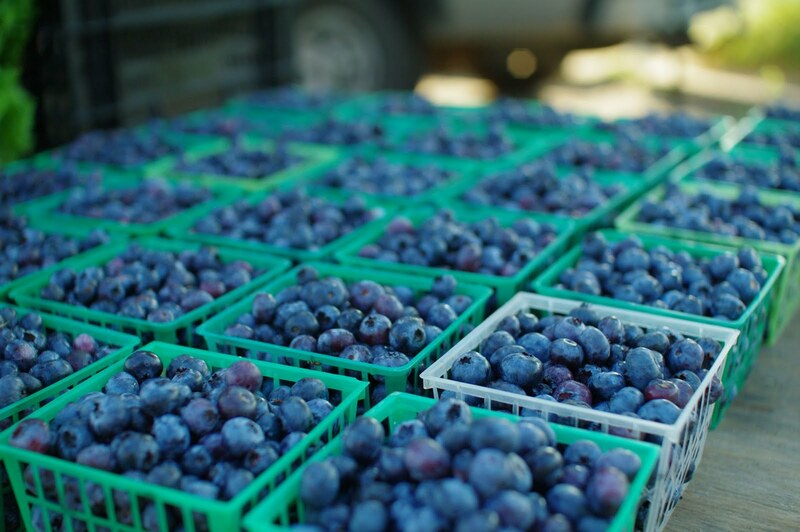 Drop by and check out their produce - Zack and his crew are always happy to talk about what they're up to at the farm. 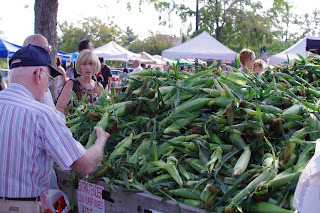 Also on Thursdays, there's the Historic North First Street Market near downtown Champaign. 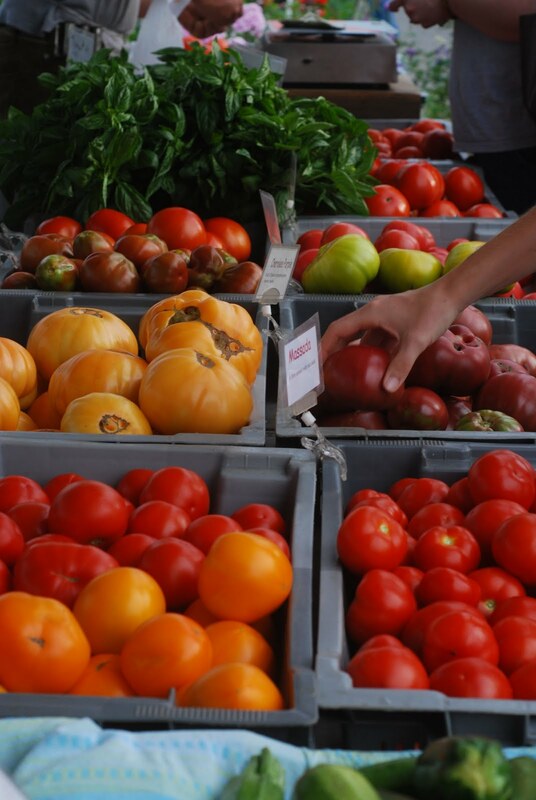 This afternoon market runs from 3-7 PM and is perfect for some post-workday shopping. 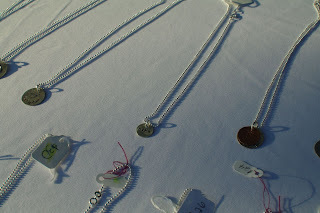 This market runs through the last Thursday in August. 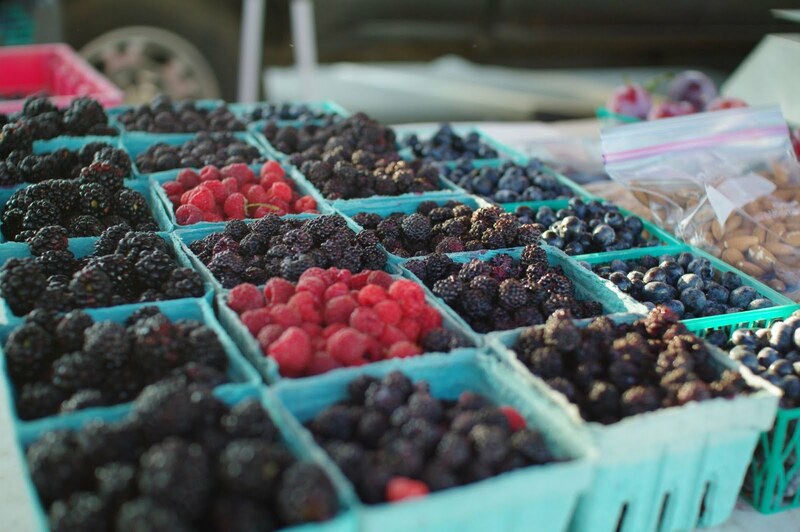 Markets are a fantastic opportunity to meet face-to-face with people producing your food and other goods. We hope you make ours a stop this Saturday - the last Saturday in July! First of all? It's going to be hot. There's no way around it. We provides water at our tent, but if you're coming to the Market for an extended visit, you might want to bring your own water, too. A hat and some sunscreen wouldn't hurt, either. Things will really start warming up after 9 AM, so come early if you can. ...the Holy Trinity of Summer has arrived. For the next bunch of weeks we'll have all three, but starting right now - July - to mid-August? The absolute, ultra-peak time for peaches, sweet corn, and tomatoes. Maybe even in the same meal. Probably not the same dish. Other produce: berries galore, summer squashes and zucchini, cucumbers, onions, garlic, carrots, peppers, beans, lettuces, beets, okra, potatoes, cabbage, and much more. You'll get the best feel for what's at the Market if you shop all the rows - don't miss a trick. Of course, great companions to these showpieces of the Market include the other farm-raised foods - the meats, the cheeses, the farmstead gelato, the honey, and the eggs. 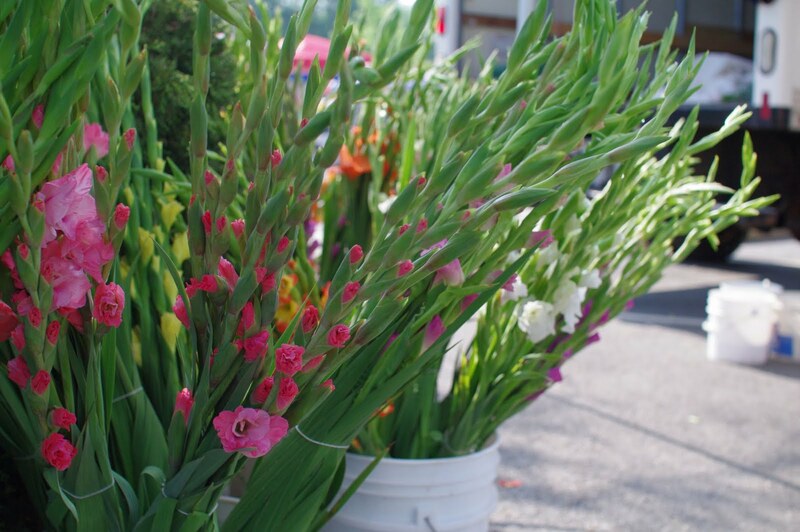 And no table would be complete without fresh flowers - the glads are in and we wouldn't be surprised to see some tuberose in the mix this weekend, but it's not for certain. Prepared foods: CraveTruck will be offering up fresh street waffles in the SE corner of the Market. Fryer Tuck will be providing their delicious breakfast sandwiches, among other things, in the same area. Bakeries located throughout the Market will be selling pies, cupcakes, breads, cookies, pastries, cakes, and other lovely things. Pasta Alley offers up handmade pasta in Row 4. 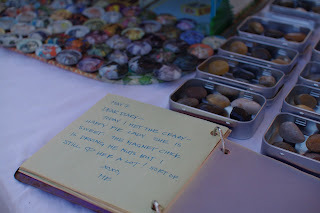 Barb's Jams & Jellies sells those things and more in Row 5. The Moo Mobile will be selling ice cream ("breakfast ice cream" is big at our house in the summer) in Row 5 and the kettle corn will be in Row 3, as always. 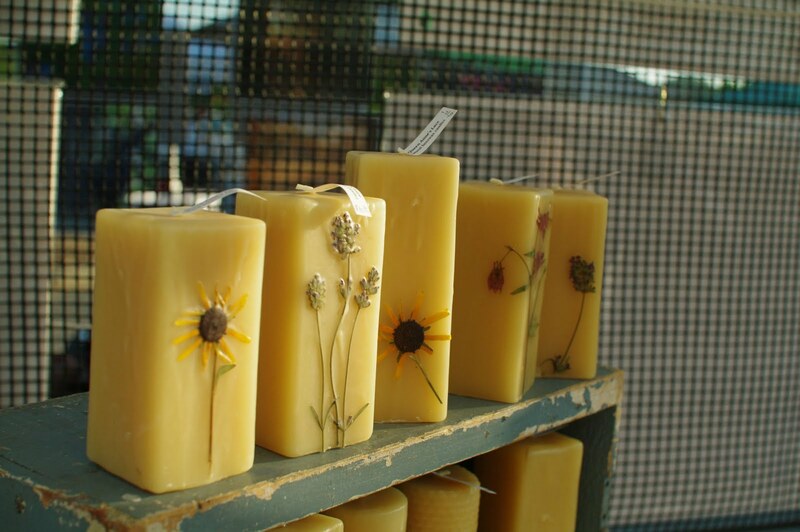 Artisans visiting this week will offer photography, glass, jewelry, leatherwork, woodwork, soap, textiles, and more. 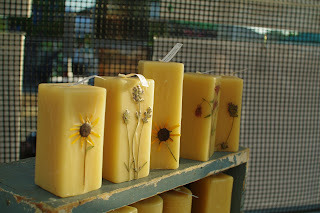 Beautiful work from local artists is a Market staple. Community groups, now located on the west side of the Market, come to let everyone know what's happening in our community. This week, our visitors include the Urbana Business Association, the UP Center, AWARE, the Eastern Illinois Foodbank, Urbana Park District, Amasong, the Champaign County Forest Preserve, and several others. These groups have much to offer - news, volunteer opportunities, and much more. The next Art at the Market event is July 30, and the next Sprouts event - all about corn - is August 13. We'll see you out there! Here are some photos of produce from last weekend's Market - taking snaps of the stuff can't be helped. It's so ATTRACTIVE in the early morning light. We threw in some particularly lovely candles and pendants for good measure. C'mon. Look at those blueberries. You can look at these photos in larger sizes and other photos from the Market here. 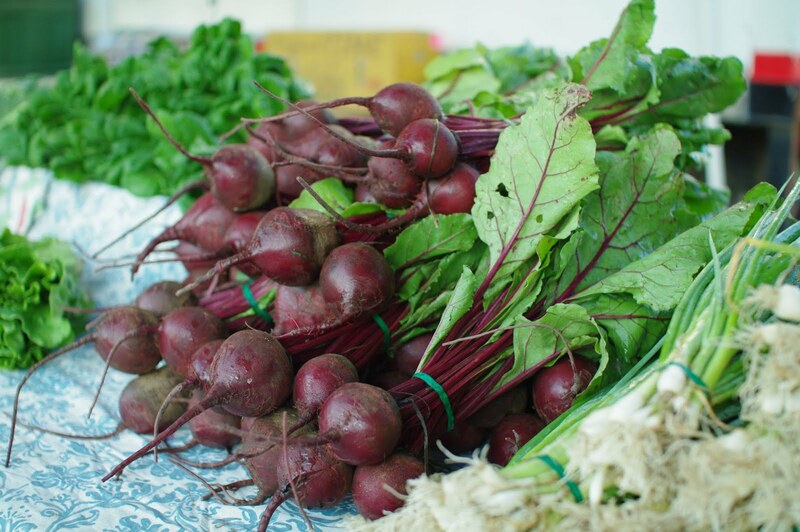 Produce this week will look a lot like what you see above, plus some sweet corn, peaches, green beans, salad greens, kale & chard, fresh herbs, potatoes, peppers, and more. 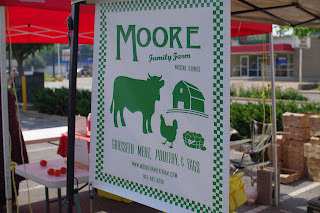 Other farm products - honey, farmstead gelato and goat cheese, meats, and eggs. Don't forget the other yummy stuff - the baked goods and the prepared foods. YUM. 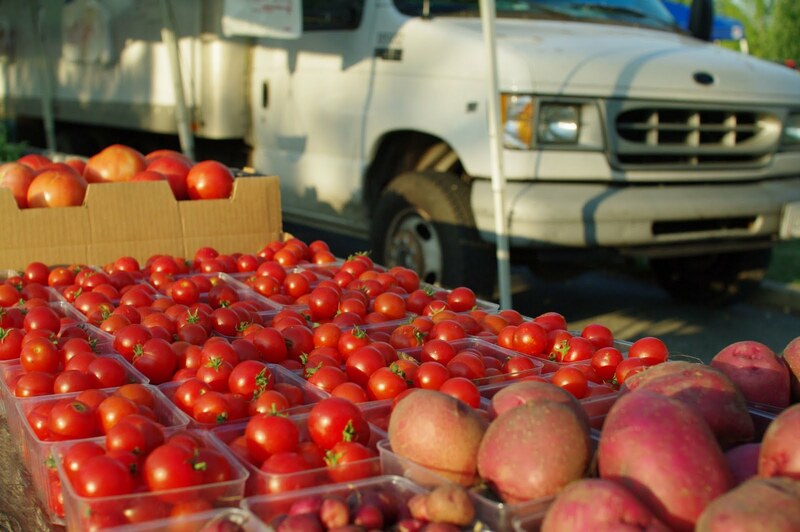 Sprouts at the Market will be in full effect from 9 AM - 11 AM. There will be several tasting stations, chicks to pet at the Land Connection's booth in the community groups area, certificates of participation for all kids completing all stations, and plenty of nutrition information. All the farmers who donated produce to this workshop will be wearing Sprouts nametags and will be happy to chat with kids about their farms. Bring your Sprout (the workshops are geared for kids ages 3-8) to the Market! The Sprouts tent will be located near the NW entrance to the Market. The Market's strategic planning effort is moving into another public input stage, this time about a draft version of the plan. Please visit the tent they'll have set up near the NW entrance to the Market and give your feedback, ask questions, etc. Community groups visiting this weekend: Baroque Artists of Champaign-Urbana, REGAP (greyhound rescue), ChambanaMoms, AWARE, The Land Connection (with baby chicks! ), Community Center For the Arts, Vet Med, and several others. Come see what's happening in your community - the groups are located on the western end of the Market, between our two main entrances. We appreciate the support we've received over the years. 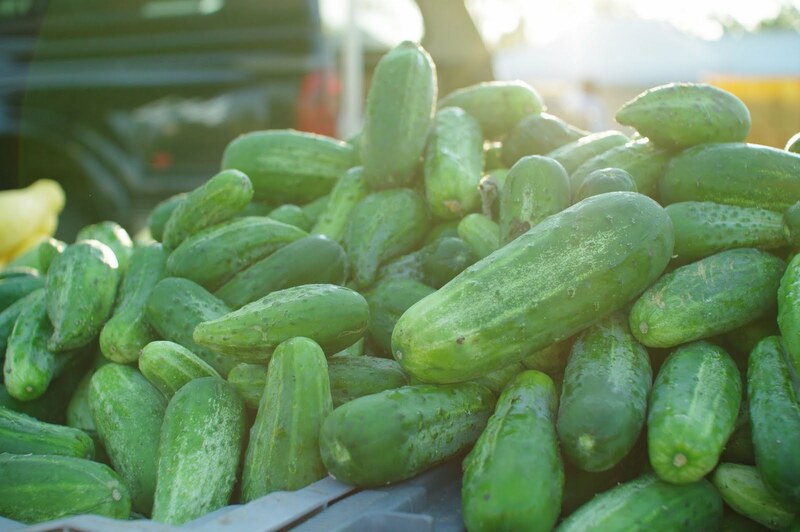 There's an easy way to support us by just clicking a few times - go here to vote for us as a favorite farmers market in Illinois. We're in second place right now! After last Saturday's swelter, it'll be nice to get back to plain old summery this weekend, won't it? So. 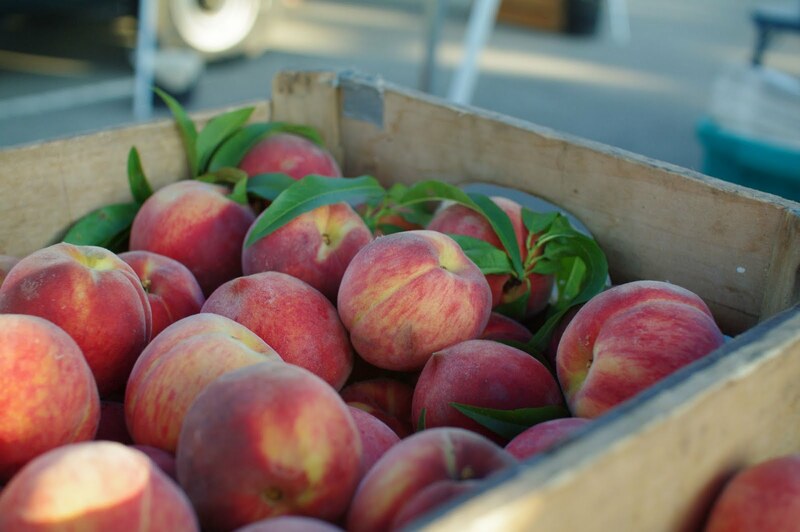 It's time for peaches. Peaches are perfect for crumbles and cobblers and pies and ice cream and shortcake and jamming and, you know, just eating plain. They're also in season, finally, and our growers who carry peaches, like Cary's Garden of Eatin' and Mileur Orchard and Sager Farms already have peaches at the Market, while others like Kleiss Produce, Eberlin's Orchard, and Murray's Orchard will have peaches very soon, possibly this weekend and almost certainly by next weekend. 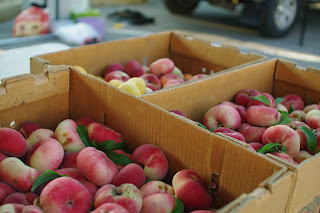 Some ideas for what to do with all those peaches can be found here. 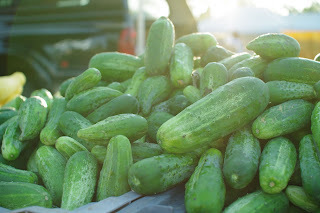 Other produce of note include berries, summer squash, cucumbers, green beans, tomatoes, cabbage, potatoes, fresh herbs, and much more. 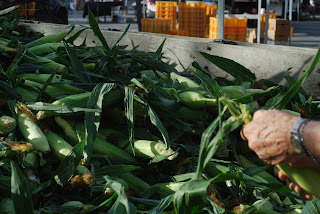 It's not likely we'll have sweet corn this weekend thanks to the cool and damp spring, but you never know. 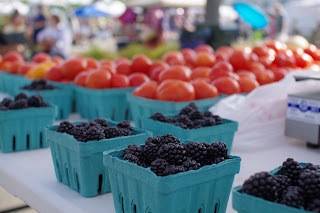 Don't forget the meats, cheese, eggs, fresh-made farmstand gelato, and honey, either! 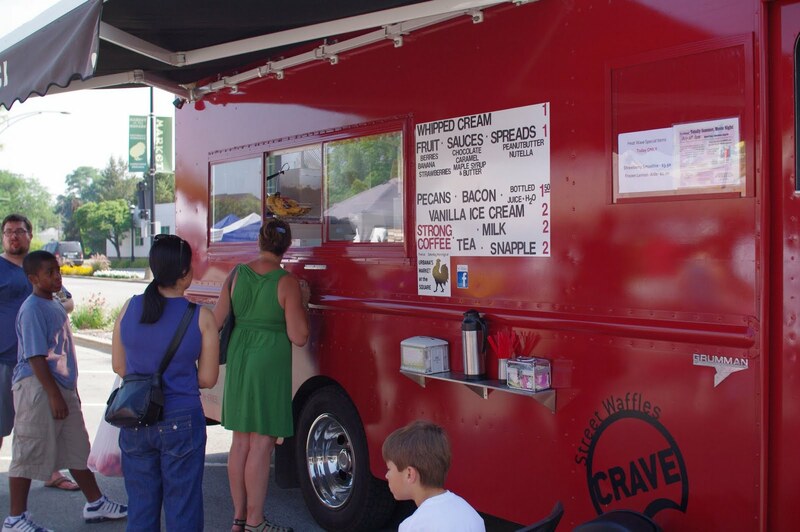 CraveTruck will be at the Market this weekend - also look for breakfast sandwiches from Fryer Tuck, kettle corn, iced coffee and teas from ArtMart, and tons of baked goods from local bakers - pie, cupcakes, rolls, breads, pastries, and more. It's a feast out there, you guys. Community organizations hanging with us this weekend: UP Center, AWARE, Eastern Illinois Foodbank, Illinois Club, Sierra Club, CIMIC, Campus Middle School For Girls, Habitat For Humanity, and several others. These folks know what's going on in our communities and want to tell you about it - please take a stroll through their area on the west end of the Market and find out what's happening around here. 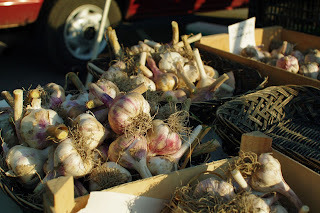 It's a glorious part of the season, the weather's fine, and the fresh food is the best you can buy anywhere, not to mention the only place you can buy it directly from the person who grew it other than the farm itself. Supporting your local growers and entrepreneurs is easy - and delicious. We'll see you out there - don't forget the sunscreen!